When it comes to pavers there are many popular types, but one economical yet attractive choice is the concrete paver. It has the durability of poured concrete without the generic sidewalk appearance. It’s less expensive than stone and more durable than asphalt. Concrete pavers come in a wider range of colors than brick. Concrete pavers come in two types – interlocking and architectural. Interlocking pavers were originally developed in Europe as an alternative to traditional road paving bricks, which were in short supply following World War II. Their durability is attested to by the fact that many roads covered in these pavers are still holding up well, after over 50 years. Many manufacturers of interlocking pavers offer lifetime warranties, and they are a good choice for paving driveways. However, some find their straight, plain shapes less attractive than architectural pavers. They contain edge spacers, which provide for a uniform overall appearance. The architectural concrete paver is thinner than its interlocking cousin, which makes it inappropriate for driveway use, and some types don’t work well if installed in areas where the ground is susceptible to freeze/thaw cycle heaving. They do, however, provide a more natural stone-like look than the interlocking options. Unlike interlocking pavers, architectural pavers rarely come with a wear warranty, but they are appropriate for all types of foot traffic uses (anything other than a driveway). Regardless of which type of concrete pavers you choose to have installed, care is relatively simply. Periodic sweeping and an occasional spot-weeding are usually sufficient. One important care tip, however: only use nonchloride (not salt-containing) ice melt in the winter. If you choose, concrete sealer can be applied to make them stain-resistant, but this sealer must be re-applied every two or three years. Without a sealant, pavers can absorb stain-causing materials such as oil or grease. And since concrete pavers are of a uniform size, repair is simple in the event one or two pavers become damaged. They can be simply lifted out and replaced. 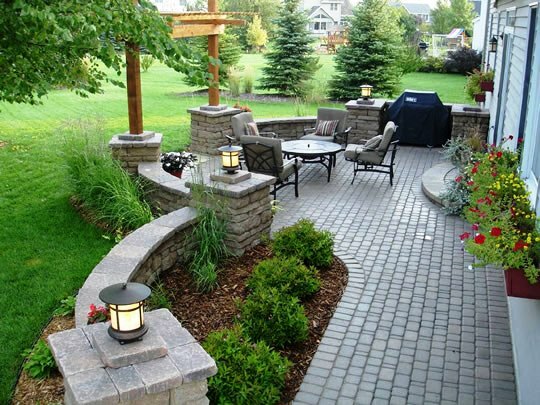 If your landscape is lacking a little polish, perhaps the look concrete pavers bring can finish the look. Hardscapes such as pavers give you more options to enjoying your landscape. If you have questions about concrete or other types of paving materials, please give us a call.